The Beast from the East has now cleared so our Senior training continues each Tuesday and Thursday at Hillingdon Athletics Stadium, Gatting Way, Uxbridge at 7.45pm. Matches start in a few weeks so it's important that we keep up the good effort in training so far. There's been a few new faces at training which is encouraging to see. The new U17 Development League has now kicked off and St Claret's are participating in this competition. 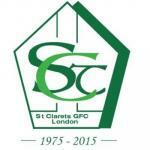 Matches take place each Saturday evening in Greenford so please get out to support our boys if you can. It will only be a few more years until they're participating with our Senior team. We are always looking to introduce new members to the club. We are a progressive club based in the Hayes and Uxbridge areas so if you are looking to join a club in West London please contact us. Help with work and accommodation is always available. We also have several youth teams including a girl's team so any youngsters looking to take up Gaelic football are more than welcome.